Borromini was born at Bissone, near Lugano in the Ticino, which was at the time a bailiwick of the Swiss Confederacy. He was the son of a stonemason and began his career as a stonemason himself. He soon went to Milan to study and practice his craft. He moved to Rome in 1619 and started working for Carlo Maderno, his distant relative, at St. Peter's and then also at the Palazzo Barberini. When Maderno died in 1629, he and Pietro da Cortona continued to work on the palace under the direction of Bernini. Once he had become established in Rome, he changed his name from Castelli to Borromini, a name deriving from his mother's family and perhaps also out of regard for St Charles Borromeo. Façade of San Carlo alle Quattro Fontane. In 1634, Borromini received his first major independent commission to design the church, cloister and monastic buildings of San Carlo alle Quattro Fontane (also known as San Carlino). Situated on the Quirinal Hill in Rome, the complex was designed for the Spanish Trinitarians, a religious order. The monastic buildings and the cloister were completed first after which construction of the church took place during the period 1638-1641 and in 1646 it was dedicated to San Carlo Borromeo. The church is considered by many to be an exemplary masterpiece of Roman Baroque architecture. San Carlino is remarkably small given its significance to Baroque architecture; it has been noted that the whole building would fit into one of the dome piers of Saint Peter's. The site was not an easy one; it was a corner site and the space was limited. Borromini positioned the church on the corner of two intersecting roads. Although the idea for the serpentine facade must have been conceived fairly early on, probably in the mid-1630s, it was only constructed towards the end of Borromini's life and the upper part was not completed until after the architect's death. Borromini devised the complex ground plan of the church from interlocking geometrical configurations, a typical Borromini device for constructing plans. The resulting effect is that the interior lower walls appear to weave in and out, partly alluding to a cross form, partly to a hexagonal form and partly to an oval form; geometrical figures that are all found explicitly in the dome above. The area of the pendentives marks the transition from the lower wall order to the oval opening of the dome. Illuminated by windows hidden from a viewer below, interlocking octagons, crosses and hexagons diminish in size as the dome rises to a lantern with the symbol of the Trinity. In the late sixteenth century, the Congregation of the Filippini (also known as the Oratorians) rebuilt the church of Santa Maria in Vallicella (known as the Chiesa Nuova -new church) in central Rome. In the 1620s, on a site adjacent to the church, the Fathers commissioned designs for their own residence and for an oratory (or oratorio in Italian) in which to hold their spiritual exercises. These exercises combined preaching and music in a form which became immensely popular and highly influential on the development of the musical oratorio. The architect Paolo Maruscelli drew up plans for the site (which survive) and the sacristy was begun in 1629 and was in use by 1635. After a substantial benefaction in January 1637, however, Borromini was appointed as architect. By 1640, the oratory was in use, a taller and richer clock tower was accepted, and by 1643, the relocated library was complete. The striking brick curved facade adjacent to the church entrance has an unusual pediment and does not entirely correspond to the oratory room behind it. The white oratory interior has a ribbed vault and a complex wall arrangement of engaged pilasters along with freestanding columns supporting first level balconies. The altar wall was substantially reworked at a later date. Borromini’s relations with the Oratorians were often fraught; there were heated arguments over the design and the selection of building materials. By 1650, the situation came to a head and in 1652 the Oratorians appointed another architect. Wikimedia Commons has media related to Francesco Borromini. 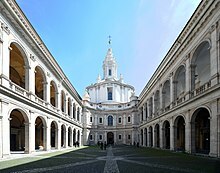 From 1640-1650, he worked on the design of the church of Sant'Ivo alla Sapienza and its courtyard, near University of Rome La Sapienza palace. It was initially the church of the Roman Archiginnasio. He had been initially recommended for the commission in 1632, by his then supervisor for the work at the Palazzo Barberini, Gian Lorenzo Bernini. The site, like many in cramped Rome, is challenged for external perspectives. It was built at the end of Giacomo della Porta's long courtyard. The dome and cochlear steeple are peculiar, and reflect the idiosyncratic architectural motifs that distinguish Borromini from contemporaries. Inside, the nave has an unusual centralized plan circled by alternating concave and convex-ending cornices, leading to a dome decorated with linear arrays of stars and putti. The geometry of the structure is a symmetric six-pointed star; from the center of the floor, the cornice looks like a two equilateral triangles forming a hexagon, but three of the points are clover-like, while the other three are concavely clipped. The innermost columns are points on a circle. The fusion of feverish and dynamic baroque excesses with a rationalistic geometry is an excellent match for a church in a papal institution of higher learning. Borromini was one of several architects involved in the building of the church of Sant’Agnese in Agone in Rome. Not only were some of his design intentions changed by succeeding architects but the net result is a building which reflects, rather unhappily, a mix of different approaches. The decision to rebuild of the church was taken in 1652 as part of Pope Innocent X’s project to enhance the Piazza Navona, the urban space onto which his family palace, the Palazzo Pamphili, faced. The first plans for a Greek Cross church were drawn up by Girolamo Rainaldi and his son Carlo Rainaldi, who relocated the main entrance from the Via di Santa Maria dell'Anima to the Piazza Navona. The foundations were laid and much of the lower level walls had been constructed when the Rainaldis were dismissed due to criticisms of the design and Borromini was appointed in their stead. Borromini began a much more innovative approach to the facade which was expanded to include parts of the adjacent Palazzo Pamphili and gain space for his two bell towers. Construction of the façade proceeded up to the cornice level and the dome completed as far as the lantern. On the interior, he placed columns against the piers of the lower order which was mainly completed. In 1656, Innocent X died and the project lost momentum. In 1657, Borromini resigned and Carlo Rainaldi was recalled who made a number of significant changes to Borromini's design. Further alterations were made by Bernini including the façade pediment. In 1668, Carlo Rainaldi returned as architect and Ciro Ferri received the commission to fresco the dome interior which it is highly unlikely that Borromini intended. Further large scale statuary and coloured marbling were also added; again, these are not part of Borromini's design repertoire which was orientated to white stucco architectural and symbolic motifs. The College of the Propagation of the Faith or Propaganda Fide in Rome includes the Re Magi Chapel by Borromini, generally considered by architectural historians to be one of his most spatially unified architectural interiors. The chapel replaced a small oval chapel designs by his rival Bernini and was a late work in Borromini's career; he was appointed as architect in 1648 but it was not until 1660 that construction of the chapel began and although the main body of work was completed by 1665, some of the decoration was finished after his death. His façade to the Via di Propaganda Fide comprises seven bays articulated by giant pilasters. The central bay is a concave curve and accommodates the main entry into the college courtyard and complex, with the entrance to the chapel to the left and to the college to the right. In the summer of 1667, and following completion of the Falconieri chapel (the High Altar chapel) in San Giovanni dei Fiorentini, Borromini committed suicide in Rome, possibly as a result of nervous disorders and depression. It should be noted that the adjectiv "Ticinensis" used in the plaque is an anachronism, since the name, related to the Ticino river, was chosen only in 1803, when the modern Canton was created by Napoleon. Francesco Borromini was featured on the 6th series 100 Swiss Franc banknote, which was in circulation from 1976 until 2000. This decision at that time caused polemics in Switzerland, started by the Swiss Italian art historian Piero Bianconi. According to him, since in 17th century the territories which in 1803 became the Canton Ticino were Italian possessions of some Swiss cantons (Condominiums of the Twelve Cantons), Borromini could neither be defined Ticinese nor Swiss. He is the subject of the movie La Sapienza by Eugène Green released in 2015. ^ "Francesco Borromini." Encyclopædia Britannica. Web. 30 Oct. 2010. ^ Later he was also nicknamed "Bissone". ^ He moved to Milano between 1608 and 1614. Carboneri, Nino. "Francesco Borromini". Dizionario biografico degli Italiani. Treccani. Retrieved 22 May 2014. ^ See Connors J., Borromini and the Roman Oratory: Style and Society, New York, London & Cambridge (Massachusetts), 1980, and Kerry Downes, Averlo format perfettamente: Borromini's first two years at the Roman Oratory, Architectural History, 57 (2012), pp. 109-39.
in peace he rests with the Lord. ^ a b De Bernardis, Edy (June 2006). Bettosini, Luca (ed.). "Il Boccalino" [The little wine jug]. La Terra Racconta (in Italian) (34). Retrieved 8 May 2015. Wikisource has the text of a 1911 Encyclopædia Britannica article about Francesco Borromini. Marvin Trachtenberg and Isabelle Hyman. Architecture: from Prehistory to Post-Modernism. pp. 346–7.